The past few weeks have rushed past. While partly due to laying low with a cold and now sinus infection, the real reason I have lost track of time a bit has been a total immersion in a new class. 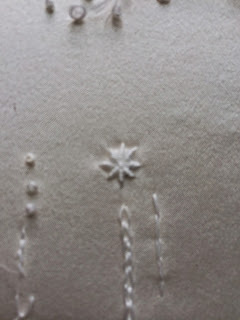 I enrolled in an online class in stitching with Karen Ruane who lives in Great Britain. Entitled Simply Stitch 3, it is structured in a way that really works for me. The class runs 12 weeks and Karen videotapes as she works along on projects that she is interested in….you get to be a 'fly on the wall'. You can play with the ideas that she is working on, or on projects of your own. There are no deadlines, requirements, or really any rules. You post photos, if you wish, on Flickr and receive feedback. You can ask questions and get advice from not just Karen but a wonderful group of people around the world who are enrolled and love hand stitching. It has turned out to be a perfect niche for me. Since there is no pressure to watch every video immediately upon posting, I have been able to relax and not worry about the fact that I have been out-of-town on two trips already since the class started. And, of course, without worry, I have been keeping up with Karen and getting more enthused every day. I am learning new stitches for me. Isn't that little stitch in the center of this photo just beautiful! So, basically I have been practicing and learning. I see many possibilities in future art quilts. 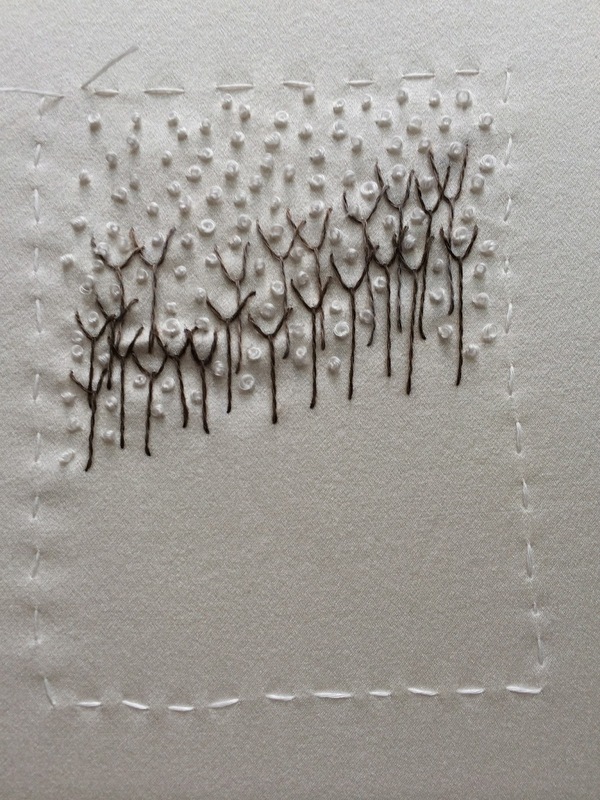 Here is a miniature I am playing with now……..I had to learn French knots..something I have never been able to execute before….so I sketched out a piece that would definitely encourage me to practice those knots. I think I accomplished that self-imposed assignment! Now I need to focus upon learning the stitches I am visualizing for those snow banks that have yet to appear in the bottom half of the piece! That piece you stitched with the French knots I would describe so far as being poetic. Your stitching is beautiful! I love your French knots and the stitch in the center of the top photo is lovely. 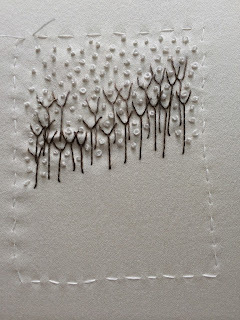 I can see you using these stitches in future art quilts! What a great class!